Giving birth to a child is indeed a gift within itself. However, many couples are also choosing to celebrate the birth of a new child with a fine jewelry memento. If you or your loved one had a child in September, below are just a few fine jewelry gifts available from deBebians that are perfect to commemorate this special time. We also have a gemstone jewelry guide, which makes it easy to find a piece of jewelry to celebrate any birth month. A necklace is a thoughtful option because this piece can be mixed and matched as well as dressed up or dressed down. The necklace features a white diamond halo which will surround a 0.50 ct, 1.00 ct, or 1.50 ct center stone. 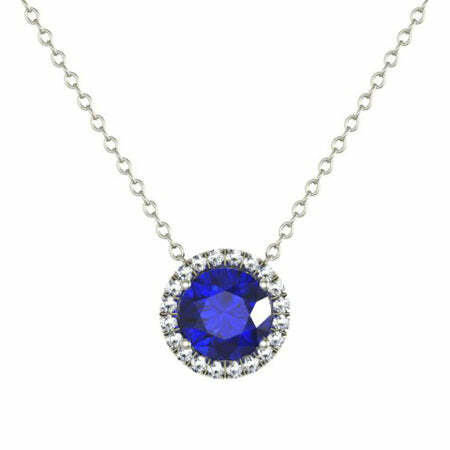 We will select a AAA quality round blue sapphire that will be set into the metal type of your choice (14 karat white, yellow, or rose gold). Our landmark eternity ring collection was created specifically to celebrate a life event or milestone. 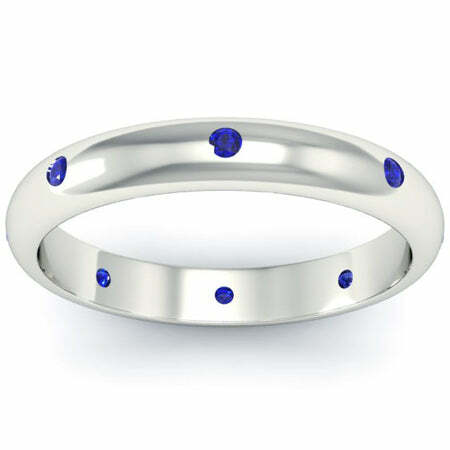 This ring features flush set round blue sapphires that will weigh approximately 0.12 cttw. The ring has a width of 3mm and can be made in your choice of 14 karat white, yellow, or rose gold. 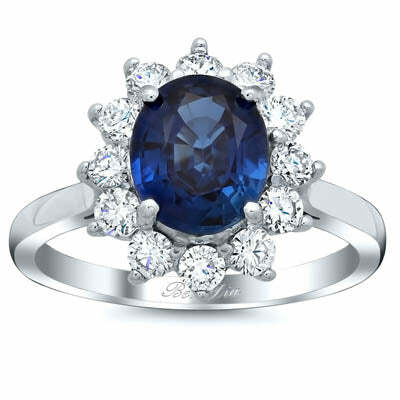 An engagement ring upgrade or a high hand ring featuring a blue sapphire is fit for a princess. This ring was inspired by Princess Diana’s (now Kate Middleton’s) engagement ring. It features an oval cut center stone in your choice of 1.00 ct, 2.00 ct, or 3.00 ct. The stone is surrounded by a floral diamond halo.